The Best Broadway Stage Manager April Fools joke! The best Broadway Stage Manager April Fools joke! I was told this story many years ago and it’s still the best stage management April Fools I’ve ever heard. 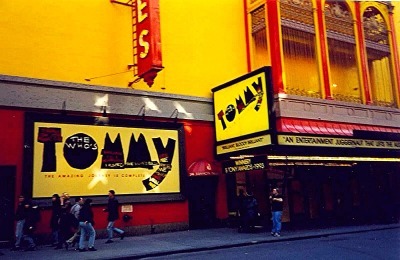 This was way back in the 1990s during the Broadway run of The Who’s Tommy. The back story goes like this… The cast was notoriously late for places all the time and it was becoming a problem starting the show on time. So the stage managers needed to find a way to impress upon the cast that they needed to get to places on time. Well, April 1st was approaching. Not sure who had the initial idea, but the stage managers devised a plan. Working with the sound department, they made a recording of the overture. If you know The Who’s Tommy, you know the opening is like being shot out of a cannon, in typical Des McAnuff style, the show starts fast and furiously. So… on April 1st, just a couple of minutes after making the fifteen minute call, the stage managers blasted the recorded overture over the backstage page system. The cast came running to the stage, as they were of course, not ready. They were in various states of dress and trying to put on jackets, shoes and more on their way to the stage to make their first entrance. Upon arriving at the stage, the entire stage management team was waiting for them on stage! “April Fools” they shouted, as the company arrived expecting the show to have already started. The company went back to their dressing rooms, finished getting dressed and then began the show as usual. No surprise, the cast was much more punctual for places from that day forward! Finding ways to give notes and keep up company morale are important to stage management and if you can do that with a sense of humor, all the better. Enjoy!